Gonzalo Higuaín looks set to spend the rest of this season on loan at Chelsea after they agreed a loan deal with Juventus, including an option to buy come the end of the season. The deal also gives Chelsea the option to extend the loan by one year, should Higuaín reach certain targets in the next six months. The Argentina international has spent the first half of this season on loan at AC Milan after Cristiano Ronaldo's arrival at Juventus made him surplus to requirements. He has scored eight goals while playing for Gennaro Gattuso, but has not scored since October and is believed to be itching for the move to Chelsea, where he will reunite with Maurizio Sarri, who coached him at Napoli. 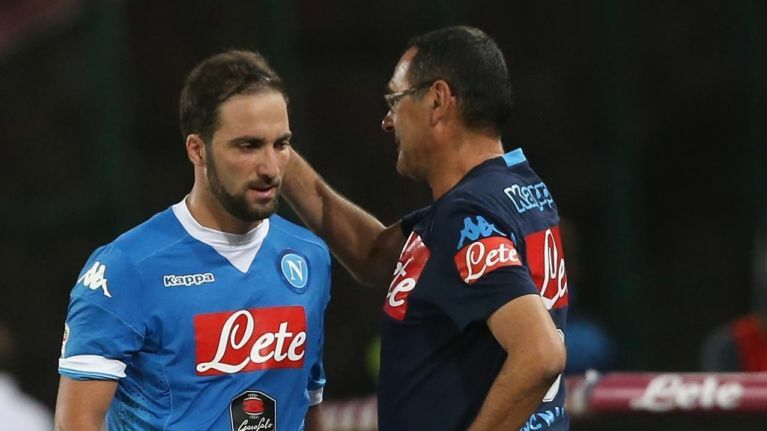 During his three years at Napoli, Higuain scored 91 goals in 146 games in his most prolific spell as a player, successfully filling the void left by Edinson Cavani after he left for Pars Saint-Germain. At Juventus, he maintained a strong goals to games ratio with 55 in 105, and Chelsea will be hoping he can hit the ground running in the Premier League, having struggled to settle on a centre-forward this season. Álvaro Morata, who began this season as Sarri's first choice striker but has fallen down the pecking order due to poor form, looks set to join Atlético Madrid as a consequence of this deal, with the Spaniard desperately needing a confidence boost. At Atléti, he would play alongside Antoine Griezmann, whose striker partner Diego Costa has scored just four goals in all competitions this season - two of which came in the Super Cup against Real Madrid last August. Higuaín turned 31 in December, but continues to perform at a high level and should serve as a quick fix to Chelsea's problems in front of goal, allowing Eden Hazard to return to his favoured left wing position.